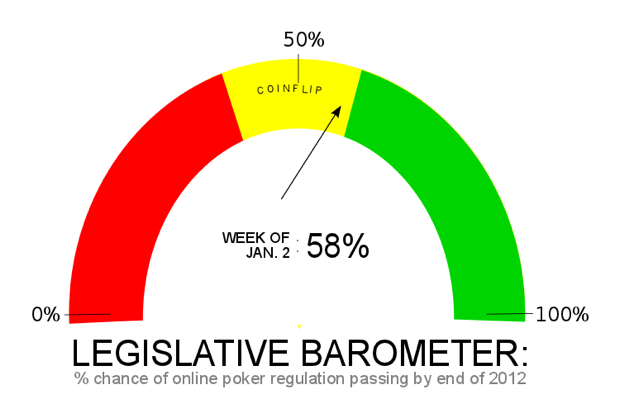 In late November we rolled out our first Online Poker Legislative Barometer. As a refresher, the Barometer is our weighing of industry executive, lobbyist, and media for their take on the likihood that the U.S. Federal government passes online poker legislation by the end of 2012. We couple those responses with some tea leaf reading from congressional leaders’ public statements–and other general industry news–and spit out our cumulative reading. Given the Department of Justice flip-flop on the 1961 Wire Act, as well as recent good news from Nevada and New Jersey regarding intrastate poker, it’s time for an update. We debuted with a 55% likelihood of Federal legislation by the end of 2012, and we’re now inching it up higher to 58%. It’s not a big increase, nor should it be, but momentum is definitely building. In turn, if multiple states get in the game, the need for Federal regulation *may* be ramped up. In the end, we feel more strongly than ever that if online poker legislation is passed through Congress in 2012, it’ll be attached to an omnibus bill during the lame duck session after the November elections. That seems to be the prevailing industry consensus from those we spoke with as well.